I don’t review these older children’s books too often, but I really should. This is a Level 2/Grades 1-3 easy-to-read book. It’s quite charming, and it’s actually ABOUT something (learn to play nicely). And while many of the books at this level that are being written and published today are still didactic, they try to teach a lesson in an indirect way. A story such as this might feature two bears trying to eat the same honey. Or a pair of caterpillars on the same leaf. Author Minarik addresses two children who aren’t getting along. But she doesn’t come right out and say “Play Nicely!” she still goes round-about, letting the children make the connection. But it’s children … not bears or caterpillars. I find that quite refreshing! There are a lot of books out there for children and it can be overwhelming on what to select. This book is considered a classic – a for a reason. It still holds up. Why take a chance on something you’re not sure about? Go to the library in that case. But this has proven to be a good book for decades so consider sticking with something that works and is still a delight. Looking for a good book? No Fighting, No Biting! 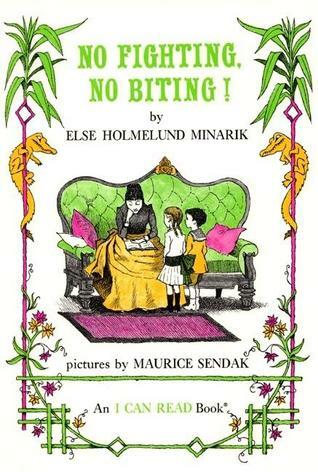 by Else Holmelund Minarik with art by Maurice Sendak is a god book for young readers.